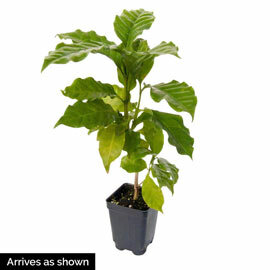 Dwarf Pacas Coffee | Henry Field's Seed & Nursery Co.
You can enjoy your own coffee, as well as enjoy the glossy dark green leaves and fragrant white flowers of this easy-to-grow, unique plant. In 3-4 years your plant will bear fruit, which will ripen to red in the fall, with a sweet pulp surrounding each bean. Simply harvest the desired amount of beans, roast in an oven or roaster and cool completely. You're now ready to grind and brew your own homegrown coffee! Can be moved outdoors in the summer for pollination. Prefers filtered sunlight. Potted plants. Zones 9-10. Light Requirements Filtered sunlight, at least 4 hours a day. Spacing: 1 plant per container. Depth: Plant at same depth as in the pot. Sun/Shade: Filtered sunlight, at least 4 hours a day. Foliage: Emerges light green foliage and turns deep green. Pollinator: Arabica is self-pollinating. 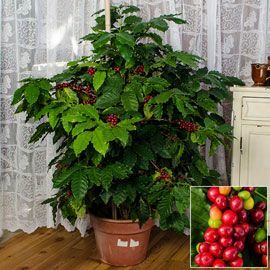 If you are growing your coffee plant indoors, where pollinating insects will not have access to the flowers, hand-pollinating will be necessary for fruit set.